Danny Kopec is one of the most talented home-bred players in the US. Dr. Kopec was New York High School Champion at 14, National Master at 17, Scottish Champion in 1980, 2nd-equal in the Canadian Closed in 1984, and International Master in 1985. He is an active player, journalist, writer, chess educator and scholar. His competitive results with top-flight chess professionals have always been remarkable. He has also delivered many chess courses, lectures, published seven highly recognized chess books, and has developed eight highly regarded instructional videos (18.5 hours). Over the past 16 years Kopec’s Chess Camp, has become world renowned. In parallel with his chess career, Dr. Kopec has pursued an academic career in computer science with research in artificial intelligence, software methodology, and computer science education. For more than 20 years Kopec has been testing and evaluating hundreds of human and machine chess players in the UK, Canada, and US in order to quantify their overall chess strength, their specific deficiencies and definite abilities. In bridging his chess and academic interests, Kopec has developed a reputation as perhaps the world’s greatest exponent of chess knowledge. 1.During you many years of involvement in chess was there a time when you considered giving it up? Well, in order to answer this question I feel that it is important to give a little background about my involvement and past, leading to the present, with the game of chess. First of all, I have always believed that the game of chess is a great game – there is nothing wrong with the game of chess. There may be problems with chessplayers and with the way chess tournaments are run, but the game itself remain unassailable. I learned the game at age of 8 from my cousin Joseph Donath, an expert, who lives in Pembroke Pines, Florida. Joe taught me an aggressive but sound style of play that I hope I have stayed true to. At 12 I entered my first tournament, The Greater New York Elementary School Championships, run by Bill Goichberg at the Henry Hudson Hotel on 57th Street in Manhattan and scored 6 – 2 to tie for 5th – 9th. This was very encouraging and I went on to win a number of Junior High School, High School (Greater NY HS Chamion at 14 (1968) and other tournament titles, including the Scottish Championship in 1980 and 1981, third equal at four US Opens (1974, 76, 1987, and 1988) with a score of 9-3 and 2nd equal with 7-2 in 2004. I also tied for 2nd in the Canadian Invitational Championships in 1984 with a score of 9-5. I became an expert at 15, a master at 17, and was rated around 2350 during my College years. I officially attained the title of International Master in 1985. You can see my other chess details at …. Once, at age 15, I lost a game to a person I beat in my first tournament, Roy Greenberg, and in a temper tantrum I threw all my chess sets and magazines down the incinerator. This was somewhat regretful (and disrectful to my father who paid for everything – (a lot less than parents pay today for lessons, equipment, etc) – a week later I was back to studying chess. I really used to enjoy playing over chess games (at the expert level to GM level) from Chess Life while I was watching New York Yankees Games on TV. The pace of baseball goes very well with chess study. Otherwise, the answer to your question is NO. I have always loved the game of chess., just for its own sake, and whether my own game may have seemed to have hit a standstill or not, has not affected my appreciation and love of the game. Furthermore , lest you not think that ratings represent everything. My rating is lower now than it’s been in many years, but this has nothing to do with my understanding of the game – as you get older you realize that other factors (LIFE) affect outcomes in chess play more than you might realize. 2) What was the strangest thing that ever happened to you over the board in a tournament game. Of course during the course of a career spanning over more than 40 years, one will have a number of unusual experiences. 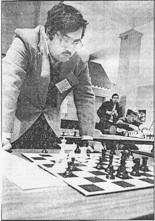 In 1978 I was playing Juan Bellon, as Grandmaster, in the first round of the Lloyd’s Bank Masters in London. I played an exchange sacrifice which didn’t really work in the middegame to avoid immediate disaster. Suddenly the director came to me and stopped play because Mr. Bellon’s health did not allow him to continue. In order to reach an equitable solution, I agreed to a draw. Once around 1974, I went to a US Open Tennis Championship in Forest Hills with my dad, as was our routine during those years – we could literally walk a mile to get there from our apartment in Kew Gardens, Queens, New York. Roscoe Tanner was playing Illie Nastase, the Roumanian magician. As Nastase easily won the first set, my dad chuckled, that this was going to be a one-sided exhibition match. However, Nastase has consumed so much energy producing the brilliance and antics which typically accompanied his play that in the second and third set there was indeed no match – as Tanner, with his powerful serve, quickly rolled over Nastase in the second and third sets. This reminded of my two games with the affable Argentinian GM Miguel Quinteros in the summer of 1983. I played him in the New York Summer International in 1983 (as Black) and then as White at the Lloyd’s Bank Master’s in London later that same summer. Both games occurred around Round 6 or 7 in the nine round events where it was critical for me to win to attempt to achieve an IM norm. In both cases Quinteros completely outplayed me in the opening. But then he disappeared for long periods of time. Where was he? He was on the phone? On the phone with whom? His good friend Bobby Fischer? I doubt it. It was probably his wife who I heard was a beauty Queen. In both games I found sacrifices in the middlegame which suddenly demanded more and more of Quinteros’ attention. In the first game it was a very speculative Rook sacrifice. The second game, in London, was a more sound sacrifice. So yes, akin to the tennis example, what seemed like a one-sided affair at the beginning, turned into a fiasco where the tables were quickly turned and the underdog won in spectacular fashion. 3) Which successes in terms of tournaments or games left you most satisfied? Of course there are many such wonderful moments and games. When I won the Greater New York HS Championship in 1968 with a 7-1 score that was a great satisfaction to me. Later in 1975 I won the Continental Open with 5-0 and $1000 first prize (although the Westchester Police took its $65 tax stopping me for speeding back to Dartmouth College). Once during the Pan American Intercollegiate in Atlanta (?) December, 1975 I was a newlywed and went with my new bride to the tournament where we had met a few years earlier. During one game I got over an hour ahead on the clock playing my system with an excellent position. So we were able to retire to our hotel room to do what newlyweds do while my opponent suffered with his bad position. I came back about a half hour later to polish him off. At the previous year’s tournament in Louisville Kentucky I scored 7 ½ - ½ but did not receive the Board 1 prize. Doug McClintock got it for a higher percentage with 7 – 0. So that year (1975) I made sure to get the prize by scoring 8 – 0. 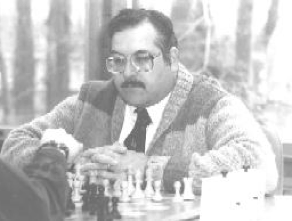 Beating GM’s Alexander Yermolinsky and Alexander Ivanov in consecutive rounds of the Continental Class Championship in Woburn, Massachusetts in 1994 had to be some of my most satisfying chess, the games requiring a total of about 11 hours that Saturday, starting at 1:00 pm. I had just signed contracts with Bob Boylan for the DVD’s How To Visualize Combinations, Pawn Structures and How to Play Them, and How to Analyze A Chess Position which you can still enjoy. Hal Terrie and I had just agreed to start running the Chess Camps which I have been doing for 16 years. New Productions of these three DVD’s as well Opening Pawn Structures: Advanced Concepts Volume 1 and Volume 2 will be out soon. These promise to be the best chess video productions to date. So you can see that some of my most memorable moments at the board were related to happiness away from the Board. 4) At what point in your career did you realize you wanted to be a master? That was a natural goal – to get one’s rating over 2200, as soon as I saw steady improvement. My improvements came in quantum leaps. I went from 1031 at age 12, to well over 1300, then 1600, 1800 (age 14) over 2000 (age 15) and over 2220. all at sudden intervals. I was blessed to have been naturally motivated. Even though I had my cousin Joe to answer questions whenever I had to, I did not need to be pushed. I enjoyed playing over chess games. I already had Bobby Fischer as our chess idol (even though he went into long periods of absence from tournament play in the 1960’s). I enjoyed spending quiet evening and weekend hours playing over chess games, analyzing my own games, or with other chess friends while I watched baseball or other sports. Yes, you could say, “A Little Nerdy” but as I said in my video Pawn Structures and How to Play Them: “No pain, no gain.” Still, I feel I was pretty well rounded, playing team sports such as baseball, baseketball, and touch football almost every day at the park or schoolyard. 5) How did you come upon your current opening repertoire? Opening repertoires change as your life, your game and strengths and weaknesses evolve. My opening repertoire for the past 15 years or so is based on 1) my knowledge and experience 2) my desire to avoid the possible theoretical strengths of my opponents 3) my desire to exploit my strengths 4) the desire to enjoy chess and to be creative, but in a natural and sound way. 6) Who are some of your most memorable opponents? In 1977 at the World Student Team Olympiad, I played Alexander Belyavsky, (known as Big Al) and then number 6 in the world. I had a pretty nice game with him, and learned lessons never to be forgotten. Likewise, in losing to Kevin Spraggett with a score of 4.5 out of 5 I learned to respect his abilities as a full-time professional player. I learned that strong players are able to change their style according to the circumstances of a game or tournament. In 1976 at the Canadian Open in Toronto, then a game a day 10-Round, Swiss System Tournament, I met Walter Browne in the middle rounds of the tournament. I played my system and Browne kept exchanging pieces down until we ended up in a very slightly favorable (to him) Knight Ending. Browne displayed very fine technique and after that we went out to dinner and we’ve been good friends ever since. You would think that I would best remember the opponents (particularly strong ones) that I crushed or played spectacular games against. Those I can list separately, but by most memorable, I trust you mean over the board, pre-game and post game experiences, and to those are the people who I consider to have behaved best as opponents overall – to have kept proper chess etiquette, win or lose. To me probably most memorable in this regard is GM Alexander Ivanov. My pretty good score against Alex is probably because I really like him and his no nonsense serious attitude for every chess game that he plays. Chess is truly his passion. Another player who has this attitude is John Curdo. Email Webmaster with errors/broken links.